Scott Weiland, the provocative and soulful singer of Stone Temple Pilots and Velvet Revolver, has died. He was 48. The news was first released via a tweet from Jane’s Addiction guitarist Dave Navarro, who said, “Our friend Scott Weiland has died.” (His initial tweet has since been deleted.) But it’s been confirmed, as Billboard reports early this morning. As of yet, there’s no cause of death, beyond an initial report that he died in his sleep. The California native formed his first band with brothers Robert and Dean DeLeo, with Stone Temple Pilots’ first album Core hitting the Billboard album charts at number three in 1993. Their follow-up, Purple, saw even greater success, including the number one hit “Interstate Love Song.” After the first several albums, however, infighting broke up the band, with Weiland going on to perform with rock supergroup Velvet Revolver, even as his former bandmates carried on without him. 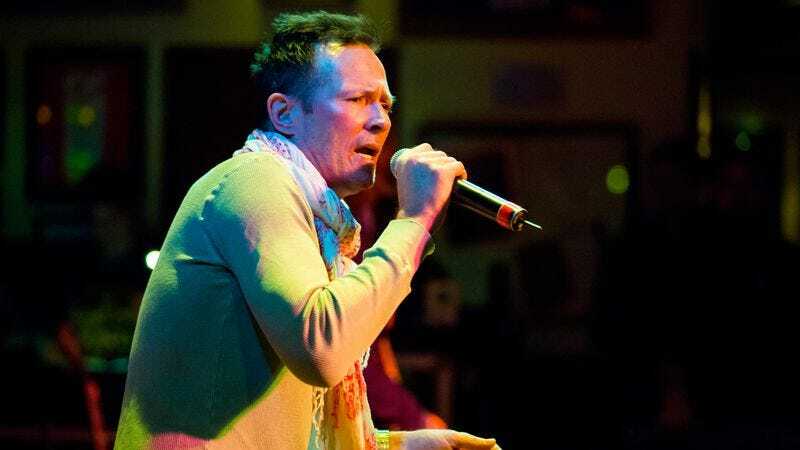 Even before his departure from Stone Temple Pilots, Weiland publicly struggled with drug abuse. He was arrested in 1995 for buying cocaine, and sentenced to probation. He was also arrested several times in the 2000s for DUI, and reportedly spent repeated stints in rehabilitation centers. As of the time time of his death, he had reportedly been on another rehab program. No additional details are forthcoming at this time.